Blurb: No:Carrier – music not just for elevators anymore! A huge departure from the elevator music that was Between the Chairs, No:Carrier’s new album again redefines the band’s sound. Last Scene has a distinct feel of dark cabaret adding an increased layer of complexity to the former (mainly) darkwave sound. No:Carrier has undergone an evolution of sorts over the years – some say for the better, some for the worst. The sound has undoubtedly grown more complex over time, but at the cost of anything truly captivating. Last Scene proves that No:Carrier has the ability to create music that can be both. It is often considered conventional wisdom that remix albums are either a dicey prospect or likely to be ignored altogether. But, No:Carrier is continuing a tradition in the electronic genres that has grown strong in the last few years; a tradition of exceptionally quality remix albums. Last Scene seems disjointed at times as small but noticeable synths creep up into the music as if they were standing in the unlit corner of your room the whole time, waiting for just the right moment to whisper out to you, and some steal the show tickling your inner ear with their analog grittiness. In a vocal style at times reminiscent of Jill Tracy, Cynthia Berger’s sweet and tensionless voice is finally brought fully to life by the perfect amount of distortion. The album starts with a specific strut that’s difficult not to sway your shoulders to. The lazy rhythm section of the album contrasts well with Cynthia’s vocals and the nervous synthesized horn section. The synth, guitars, and sultry silky singing are both foreboding and catchy. Last Scene is clearly the soundtrack to a gloved hand lighting a cigarette in an ivory cigarette holder. In this writer’s opinion, cabaret never crossed over with industrial so well, but as the album moves forward, the music naturally sheds its sleek cabaret melodies for spooky tones and distorted synthesizers. The complexity and variety of the soundscapes never allows you time to suffer listening fatigue as each element sits perfectly in the mix and none ever last too long. 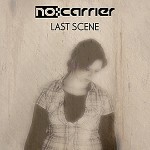 If this is only a taste of what’s to come from No:Carrier, then this writer will anxiously await the band’s new album. But as an act that is often hit or miss, only time will tell.